Spark is a six-month programme exclusively for current students at LSBU who want to turn their ideas into a business while they study. Students get to test out their ideas and create a viable product or service. The programme includes up to £500 funding, mentoring, office space (hot desking), legal support and access to networks. 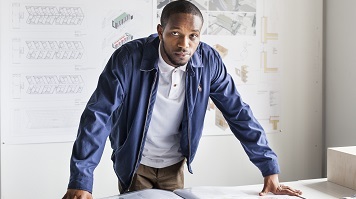 Architecture student Peter Oboko’s business idea is Personal-Printers Ltd, a printing company for students and professionals that provides a tailored service and delivery method. With his business idea turning over in his mind, Peter first saw an advert for the Spark programme on one of the interactive boards at the entrance to the university. After visiting the website and finding out more information about the requirements and what the programme actually offers, he spoke to his business partner and together they decided that it was a worthwhile venture to embark on. The support offered also helped Peter and his partner to identify ways to reduce the cost of goods sold by contacting suppliers directly or seeking alternative manufacturers. They then developed a platform to engage with their customers in order to gain much-needed feedback. In terms of marketing, they were helped to utilise social media, invest in books and have been pointed towards courses that will help them to further improve themselves and, in turn, provide a better service to their customers. In terms of challenges, Peter says that time management was a huge issue due to the fact that he studies a very demanding course and so balancing business, Spark, university and other life events was something he had to learn how to manage. Creating a schedule and dedicating the right amount of time to each task was how he overcame this challenge. Find out more about the student enterprise team.